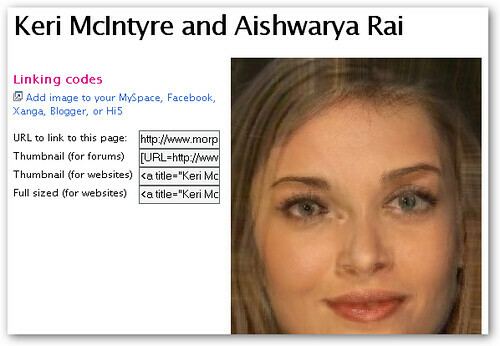 Ever wonder what the love child of unwitting YouTube celeb Keri McIntyre and B/Hollywood star Aishwarya Rai (to pick two random celebrities) would look like? Just look above. MorphThing is a fun, but time-wasting, tool that lets you match up celebrities and see what the results are of "morphing" two or more celebrity faces together. It's actually a lot more interesting than it looks like on the surface. If you want to upload your own picture to morph, you'll have to "prepare" it by identifying key facial features so that MorphThing can accurately match up the parts of the face to combine together. All that means is that you have to place little green dots on locations like the eyes, forehead, and mouth because otherwise the site can't tell what's what. After that arduous multi-step process is complete (there are a lot of dots), you can finally have fun and start creating your own custom morphs. Of course, you could always play around with the pre-loaded celebrity images on the site and mix-and-match to your heart's content that way to create your love child images. Once you have created your morph, you can easily share it on your blog, MySpace profile, or anywhere else with MorphThing's pre-generated HTML code.